Otters are probably one of our best loved animals, so it is surprising to realise that they were extinct in Essex by 1986, mainly due to agricultural pollutants in our streams and rivers. Luckily bans on certain chemicals, and the removal of lead from petrol has allowed otters to re-establish themselves along many Essex rivers. Everyone thinks they know what an otter looks like but a large number of sightings turn out to be North American mink. In reality the animals are quite distinct. Mink are much smaller, about the size of a cat or ferret, with a dark coat and distinctive white chin patch. 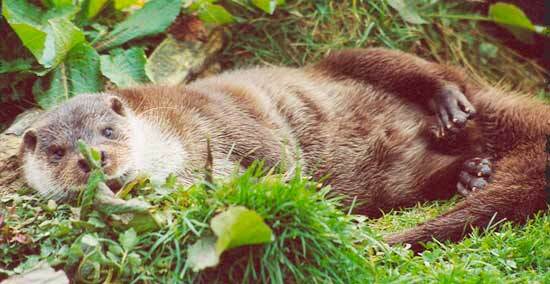 Adult otters are up to twice as long 90cm-1.2m (3-4 feet) and weigh 7-11kg, ten times as much as a mink. They have light fur under the throat, brown above and have a characteristic spiky appearance to their fur when wet. Otters are semi-aquatic mammals that spend most of their lives in, or near water. However if they are searching for new territory they may walk many miles overland, even from one catchment to another. They can breed at any time of year and cubs remain with their mother for anything up to twelve months, after which the family group breaks up, often prompted by the mother. The males are fiercely territorial and can pose a threat to a mother with her young so females often use well concealed holts (the name for their dens) to rear their young. The cubs emerge after two months and while able to swim, are still totally reliant on their mother for food. She will often take them to small tributaries to teach them to fish, safe from strong currents or male otters. Most activity takes place from dusk to dawn with otters resting during the day. Otters will leave droppings, called spraints, on prominent ledges, logs, tree roots and shingle bars near the water’s edge to mark their territory which can be 15 miles or more. 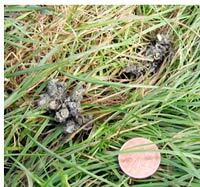 Spraints are distinctive as they are full of fish scales and fish bones and are the easiest way to establish whether otters are present in a river. Unfortunately otters get killed every year crossing Essex roads. As they are mainly nocturnal, the death rate rises dramatically over winter when the hours of darkness are greatest and especially when dusk coincides with rush hour traffic. Most deaths occur where roads cross water courses, often due to unsuitable bridge designs or high water levels. It is illegal to trap or harm a wild otter but some still die every year from by drowning in fyke nets and crayfish traps. It took less than fifty years to all but destroy the Otter population in Essex. 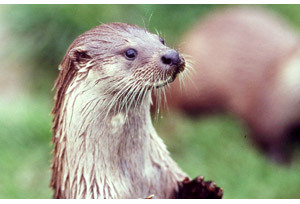 Habitat destruction, major property developments and the effects of toxic chemicals used in agriculture and industry in the past wiped out these superb creatures so that by 1986 Otters were extinct in Essex. Wetland habitats could no longer support the magnificent Otter nor many other less prominent wildlife. 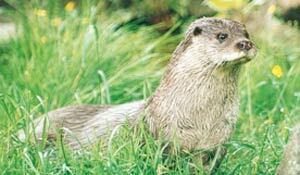 Otters are at the top of the wetland food chain – they are the barometer which tells us how healthy a wetland is. Thanks to the conservation work of many, including Essex Wildlife Trust, we have confirmation that Otters are slowly returning to the county. In the early 1950s Otters were widespread and common in Essex. Over the subsequent thirty years they experienced a massive decline with surveys in the mid 1980s suggesting they were extinct in the county. This population collapse was attributed to a decline in habitat quality and an increase in environmental contaminants accumulating in the food chain leading to poor reproductive success and survival rates. Otters now appear to be doing well in Essex but there are some worrying developments that may become an issue in the future. As mentioned above, Otters fall victim to traffic accidents as they attempt to cross busy roads, especially in the winter. Design of bridges is particularly important and now in most cases is recognised as something to be addressed before construction. However where accident blackspots occur it is important that appropriate mitigation is applied. Additionally many river bridges currently prevent Otters from colonising other areas. With relatively simple modifications, Otters would be able to move freely underneath. Also, as Otter numbers increase, they inevitably require more territory, and this can bring them into conflict with man. 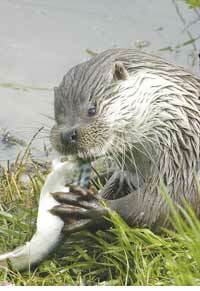 To allow Otter populations to broaden, riverside habitats in Essex need to be improved. Reed beds should be encouraged as they provide cover and resting sites for Otters, and the restoration of degraded waterside habitat is needed. However, while much has been done to re-establish Otters here in Essex, there is still a great deal more we can do with your help. Otters are undoubtedly one of our county’s most charismatic and elusive species. It is only due to the efforts of a talented group of volunteer surveyor’s that it has been possible to chart their impressive re-colonisation of our waterways. 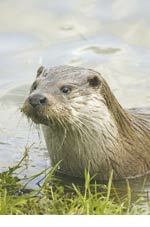 The Essex Otter Survey was set up in 2007 and has now been incorporated in to Riversearch. See the latest survey here.